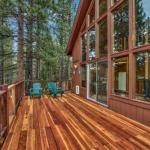 The Breen Family Chalet a property with a tennis court and a fitness centre is situated in South Lake Tahoe 3.4 km from Washoe Meadows State Park 10 km from South Tahoe Ice Arena as well as 10 km from Heavenly Ski Resort. The property is 11 km from Tahoe Queen and 11 km from Groove. The holiday home has 3 bedrooms a living room and a kitchen with a dining area and a dishwasher. The holiday home offers a barbecue. A children's playground is available on site and both golfing and cycling can be enjoyed within close proximity of the property. Powderbowl Express is 11 km from The Breen Family Chalet South Lake while Patsy's is 11 km away. Reno-Tahoe International Airport is 75 km from the property.